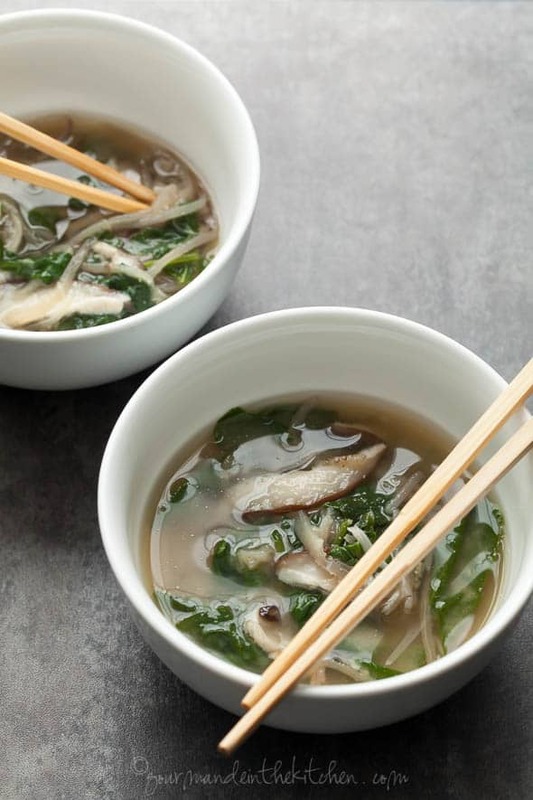 A quick and easy miso soup that both soothes and invigorates, filled with eggplant noodles, baby spinach and shiitake mushrooms. 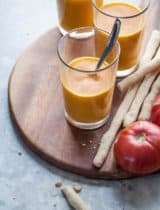 This is one of those recipes I tend to turn to at the first signs of fall when something a little warm and soothing starts to call my name. A light, brothy soup, rich in flavor thanks to the salty umami quality of both kombu and miso. 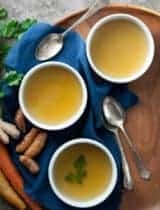 It’s quite easy to prepare and, at its core, is simply a speedy broth laced with vegetables, making it ideal for improvisation based on what you have on hand. 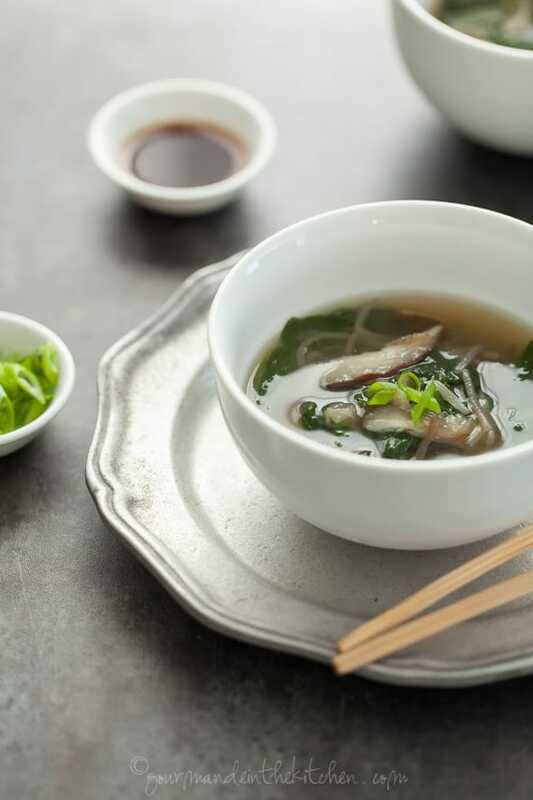 Borrowing from Asian cuisine, the soup is built on a kombu broth, enhanced with fresh shiitake mushrooms, ginger and garlic. 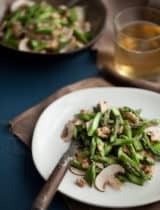 The base is gently simmered to develop the flavors before stirring in the vegetables and miso. I julienne eggplant into long strands that create long, soft, slurpy noodles in the broth. A handful of fresh baby spinach is added for color and freshness and I finish the whole thing off with a scattering of scallions and a drizzle of sesame or hemp seed oil. This is what I call nourishing comfort food and works for any time of the day. Start any meal off with a small bowl or add a poached egg for a heartier main meal. Throw in whatever quick cooking vegetables you have lingering in the fridge for endless variations. I load mine up with shiitake mushrooms, spinach and eggplant noodles but you could just as easily swap any of those those out for creminis, or broccoli, for example, if you were so inclined. 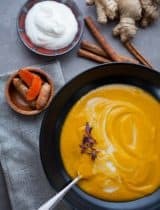 Whatever combination you choose, you’ll end up with a quick and nourishing one-bowl meal that hits the spot whether you’re feeling under the weather or just looking for a little warmth and comfort. What do you like to eat the first days of fall? In a medium sized pot combine the water, kombu, ginger, garlic and shitake mushrooms and bring to a simmer. Simmer gently while you prepare the eggplant noodles. Fill a medium sized bowl with water and add the lemon juice. Cut the top of the eggplant and discard. Using a julienne peeler lengthwise create long noodles. Place the noodles in the acidulated water as you work to prevent browning. Add the drained eggplant noodles to the broth. Simmer gently for another 10 minutes. Add the spinach leaves and continue cooking for another 3 minutes. Remove a ¼ cup of the broth to a small bowl. Add the miso, and coconut aminos and stir to dissolve. Return the miso mixture to the broth and stir until combined. 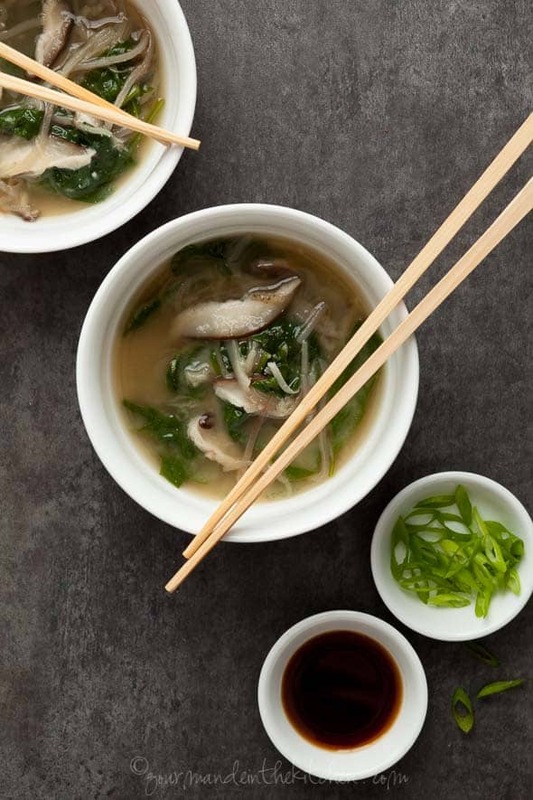 Fish out the kombu piece and serve the broth in small bowls topped with scallions and sesame or hemp seed oil. Definitely a perfect recipe for fall! Loving the eggplant and shitake's in there! Are the shitakes dried or fresh? Fresh but you could use re-hydrated dried ones here as well if you can't find fresh. This miso soup is definitely my sort of favorite food. It sounds delicious. And your photographs! So gorgeous! 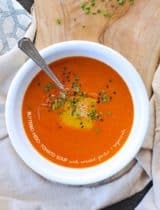 I love a comforting soup as the temperatures drop! The shiitake mushrooms and eggplant are such a perfect pairing. 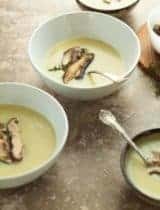 Light warm and healthy miso soup! I like the eggplant noodles idea. My kids are not into it but I always love miso soup with eggplant and I like it to be cold (so I look forward to drinking it next day after refrigerated). Beautiful photography, Sylvie! what can i use in lieu of kombu? can i use miso paste? You really need both kombu and miso here, the kombu adds a distinct flavor to the broth. 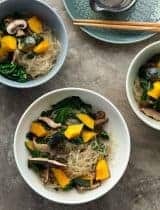 If you are having a hard time finding it you could substitute another type of seaweed or leave it out but the broth won't be quite as flavorful. I find kombu at Asian grocery stores, at Whole Foods and online at Amazon. Hope that helps! This sounds amazing and I love the idea of eggplant noodles! 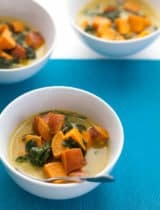 I just adore soups like this! Perfect for fall!